Unlike rectangular and polar arrays , which require only source objects and some input parameters, path arrays in AutoCAD require an additional piece of drawing geometry — a path. 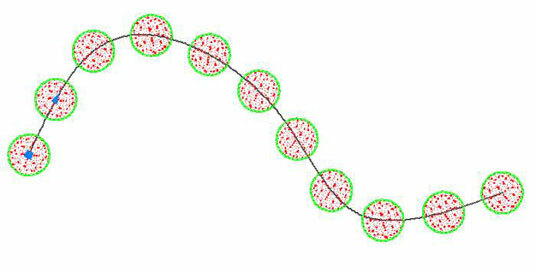 A path can be as simple as a line or a circle, or it can be a spline or a 2D or 3D polyline. Other than that, path arrays behave very much like rectangular and polar arrays. The following steps show you how to use the ARRAYPATH command to bring chairs to an elliptical dining room table and use the table itself as the path. Open a drawing containing some objects you want to array along a path (or draw some simple geometry for your source object) and then also draw a line or an open or a closed spline or polyline for your path. Click Path Array from the Array drop-down button on the Modify panel of the Home tab. At the Select Objects prompt, select one or more objects that you want to array along a path. You can select any and all AutoCAD object types, including block insertions and text. Object arraying is done based on the position of the objects relative to the starting end of the path object. If you want the arrayed objects to land on the path, they must be on the path before you select them. Select the object you want to serve as the path. Valid object types include straight lines, open or closed polylines and splines, arcs, circles, and ellipses, as well as helixes and 3D polylines. You don’t have to press Enter after you select the path. AutoCAD immediately responds with a lengthy, multi-option prompt, displays a dynamic preview, and displays the path version of the Array Creation contextual Ribbon tab. Enter the specifications for your array. As with rectangular and polar arrays, you can specify the number of items, the distance between them, and/or the length of a portion of the path to fill. A bit of experimentation will show that these options are often interrelated; changing one forces another one to change. You can also specify whether the arrayed objects stay horizontal or rotate to stay parallel to the path. Again, just like the other array types, you can jump back and forth between grip-editing, Ribbon entries, the command line options, and Dynamic Input tooltip. Put the path object on a separate layer. After you complete the array, freeze that layer, and the path object becomes invisible.